Email is the most profitable form of advertising after SEO, consistently delivering the highest ROI of the array of internet marketing tactics. The Data and Marketing Association (DMA) conducted a study, which concluded that “Email has a median ROI of 122% – over 4x higher than other marketing formats including social media, direct mail, and paid search.” Social media, by comparison, typically returns an ROI of just 28%. Despite years of predictions that social media would eclipse the older and more prosaic email, the latter outperforms the former for nearly every metric except influence and impulse purchases. When customers receive an email from a brand and open it, they are intentionally interacting with that brand, something that cannot be said of a website and social media browsers. Indri Digital recommends email marketing as a primary communication tool for e-commerce brands. It's a direct access mechanism that helps you expand through new product rollouts. Plus, people will trade their email addresses for goodies, something they are much more cautious about doing on social media. 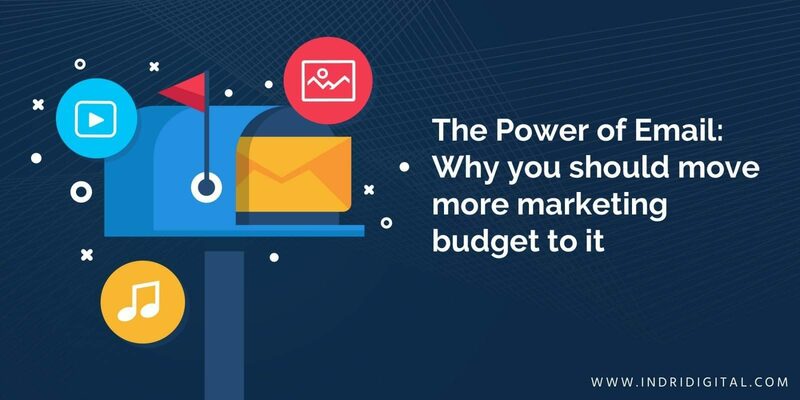 Perhaps most importantly, email marketing can succeed with a list as small as 1,000 addresses while social media requires exponentially more followers to generate the same results. Longtime consumer resistance to receiving direct mail pieces in the mailbox has led some e-commerce brands to shy away from email. But 91% of US adults say they like to receive promotional emails from companies they do business with, according to MarketingSherpa.Com, and most of these people visit their inboxes every day. They are used to seeing a collection of emails from brands they've expressed interest in. And once they've engaged with relevant and interesting educational content, occasional readers become regular readers and finally transition into buyers and brand ambassadors. For small and medium brands email is a great way to fill the top of the funnel with new prospects. In fact, McKinsey research shows it is almost 40 times more effective than Facebook and Twitter combined in helping a business acquire new customers. Emailed newsletters and announcements are easy for customers to read, share, and post on social media. Since most consumers and Millennial buyers in particular trust recommendations from friends and family over brand advertisements, a read-and-share strategy is advertising gold. Email is also easy to track, meaning brands can use straightforward metrics to learn what works for them. A simple system like MailChimp or Constant Contact gives brands all the data they need to track what content gets the highest open and click-through rates. Creating a viable list. Start your list by getting permission. In many parts of the world, it's now the law to ask people if they want to be included. Do this by offering a discount card, coupon, or low-cost gift in exchange for permission to email. Create your list in a popular online provider like MailChimp or Contact Pigeon so you can get whitelisted and keep your pieces out of the digital round file. Sending high-quality, valuable content. People give you one chance to tell them something. If what you say is irrelevant, inaccurate, or uninteresting, they are not likely to let you have another turn. Newsletters, marketing offers, announcements, and event invitations make strong pieces. Unless you have professional-quality writing and design skills, invest in other people who do. The cost is minimal, but you'll reap the benefits for a long time. Analyzing the results. Evaluation is what separates successful marketers from all the rest. Regarding which results to analyze, Nathan Hagan of Virtuous Giant says, "Though they’re all important, the 3 most important to me are open rate, click through rate (CTR), and unsubscribes." More than half the world uses email. It crosses cultural, ethnic, linguistic, political, and generational boundaries. The ROI of an email campaign has an ROI that exceeds every other tactic. No matter how sophisticated internet marketing becomes, email will be the reigning king of the castle for many years to come. It's simple, widespread, usable, and direct. Customers like it. Brands can make sense of it. And the ROI is almost always through the roof. Contact us online or at (603-879-9996) to learn more about creating an email campaign that gets real results on a budget your e-commerce brand can afford.